The UITM houses state-of-the-art laboratories dedicated to education and scientific research. The innovative facilities enable us to combine theory with practice, which is of great importance when it comes to the contemporary job market and links between science and business. The laboratories can be used by the UITM faculty when doing research and students. There is a great number of advanced technology laboratories, i.e. financial, 3D and 2D computer graphics, as well as, tele-informatics, criminology, cosmetology, and IT. The newly-established laboratories are located in the Centre for International Education in Kielnarowa. The Research and Training Centre “Laboratory of Tissue and Cell Culture” was established in order to enable broad spectrum of in vitro studies, using mammalian cell lines. The facility consist of The Laboratory of Tissue and Cell Culture and The Laboratory of Immunology and Allergology. Practical course in Immunology and Allergology. The pathology and novel biomarkers of early atherosclerosis. The Carl Zeiss LSM 700 Laser Scanning Microscope sets a new standard in confocal microscopy. Based on tried-and-approved technology concepts, the system offers innovative solutions for image analyses of extraordinary sensitivity and quality. The generation of a 3D image: Applying Z-stack allows the collection of several optical sections in the specimen to create a three dimensional image. The confocal system is more suited for thick specimens as it removes the out-of-focus light in the specimen. It allows to simultaneous detection of two or three fluorescently-tagged proteins and their co-localization in examined specimen and observation and collection of images during physiological process using time lapse recording. Fluorescent Loss in Photo-bleaching (FLIP). Microbiological laboratory is designed for working with microbiological materials (bacterial cultures, yeast and Drosophila melanogaster). The experiments related to the staining of bacterial cells, biochemical and physiological experiments and observations of microscopic identification are carried out in the laboratory. The cosmetics, beauty products are tested according to standard procedures. The laboratory is also used for research on yeast cell and genetics of Drosophila melanogaster. Thermostated rooms for culture grow. The laboratory is equipped with different computer tools and systems which can be used to develop, implement and test telemedicine systems, ambient intelligence systems, computer aided diagnosis systems as well as computer measurement systems used in the medical diagnosis. A telemonitor for remotely monitoring patients’ physiological parameters of: ECG, hemoglobin oxygen saturation (in arterial blood, the SaO2), pulse, non-invasive blood pressure (NIBP). It allows to send basic physiological parameters of the patients to the monitoring center. A telemedicine system for monitoring patients’ physiological parameters. It allows to send recorded ECG examinations through the Internet or mobile telephony. A system for presenting visual information sent by telemonitors as well as archiving that information in databases on computer disks. Programmable synthesizers, function generators and oscilloscopes for testing measurement systems. Multifunction data acquisition (DAQ) modules for developing applications using dynamic signal acquisition and sensor measurements. A graphical programming environment (LabVIEW) for developing measurement, test, and control systems. An eye-tracker for measuring eye positions and eye movement to test or develop visual systems in psychology and cognitive science. designing decision support systems based on computational intelligence. The Laboratory of Automatics and Robotics is equipped with several robotic solutions which can be used for research in fields like control theory, artificial intelligence etc. The laboratory is also equipped with five PLC Beckhoff controllers which allow to develop, implement and test software for automation systems. Beckhoff CP6000 with input and output modules. Application of IT in Automation and Robotics. This comprehensive laboratory is equipped to perform didactic experiments in three areas: physics, optoelectronics and telecommunication metrology. The main aim of this lab is to support the teaching process of graduate and post-graduate studies of Information Technology. digital and analog multimeters, laboratory balances, micrometers. basic physical experiments in dynamics, mechanics, optics, electricity and electronics, thermodynamics and others. The laboratory is equipped with high-end workstations with versatile graphical software installed, as well as with various devices, such as a 3D scanner, a 3D printer or a virtual cave. It can be used to create advanced graphical projects, starting from webdesign, through photography and visualization, to special effects and rapid prototyping. Moreover, the laboratory can be used to conduct research on virtual reality and its influence on the human psyche. research on the possible uses of the motion capture technique. The goal of the Software Engineering Laboratory is to study the software engineering discipline as well as areas that impact the way software is developed, maintained and managed. That professional laboratory allows to develop competencies within knowledge and skills concerning developing business plans for the construction of computer software, performance requirements specification, software design in accordance with the agreed methodology (structured or object-oriented), the use of design patterns, working together with other designers/developers, developing and maintaining standards of a software design team, knowing how to use assistive software development, designing and performing inspection of requirement specification, of the source code, as well as developing and testing codes, managing software configuration, and preparing project documentation. Technologies for building user programs. It is a high-tech laboratory equipped with Apple computers and the newest versions of software for photo editing, vector graphics creation, composition and other 2D graphics activities. 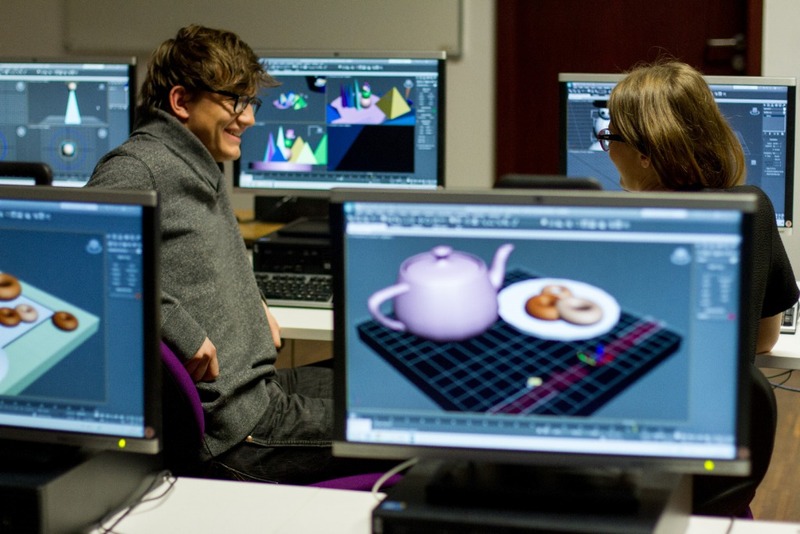 The studio is also equipped with professional software for 3D graphics creation. With regard to its ergonomics, the hardware available in the laboratory is very comfortable and enhances the workflow, thanks to which students have a chance to study on professional equipment used by graphic companies all around the world. 2 portable graphics stations with 4 core processors and professional graphic cards to support the work of computer graphics applications. Supporting the research conducted in the Laboratory of Virtual Reality and Image Processing. The main laboratory interest are the properties of sound, measurement of audio systems, room acoustics, digital sound and signal processing. The laboratory is equipped with measurement tools, an evaluation board with digital signal processors as well as room acoustics prediction software and digital signal processing tools. In the laboratory, specialist classes are conducted in the field of wired and wireless computer networks for full-time, part-time, post-graduate studies, courses and trainings. Within the subjects taught in this laboratory, students become familiar with a wide spectrum of state-of-the-art technologies used in modern data communication networks. Apart from knowledge on the latest network technologies, students gain knowledge and practical skills in design, administration and management of computer networks and also network security. Cisco Unified Communications is a comprehensive IP communications system of voice, video, data, and mobility products and applications. It enables more effective, more secure, and more personal communications that directly affect both sales and profitability. It brings people together by enabling a new way of communicating in which your business moves with you, security is everywhere, and information is always available whenever and wherever it is needed. Cisco Unified Communications is part of an integrated solution that includes network infrastructure, security, mobility, network management products, lifecycle services, flexible deployment and outsourced management options, end-user and partner financing packages, and third-party communications applications. Wireless technologies (CWNE certification preparation). Service availability analysis of GMPLS network. The IBAF financial laboratory project is patterned on the best such centers worldwide which have created professional transaction rooms at universities to provide both financial education in unique conditions and the ability to carry out the most advanced academic research. Programs for organizing and analyzing personal finance and investments. The laboratory is equipped to support research in financial analysis, financial management, risk measurement, behavioral finance and other financial fields.